A cushion cut diamond is a fantastic choice that has gained in popularity the last decade. They are especially popular for halo settings, like this one from James Allen or this stunner from Blue Nile. Cushion cuts are one of the worst shapes when it comes to retaining color. If you’re shopping for a cushion cut diamond, look for an H color or better. For clarity, it’s best to go for SI2 or SI1 for optimal value. Because cushion cuts have a large open table, it can be difficult to find an eye clean SI2. This means you might need to compromise and pay a little extra if you’re looking for a higher clarity stone. As for the cut, look for a depth of under 70%, a table of under 70% and polish/symmetry that’s Good, Very Good or Excellent. For the length/width ratio, feel free to choose whatever you like. Below, I’ve covered everything you need to know about buying cushion cut diamond jewelry, from the basics of the cut itself to color, clarity, and cut quality advice. I’ve also included a real email conversation with a reader, who we helped find a stunning cushion cut diamond ring. Simply put, a cushion cut diamond combines a square cut with rounded corners, giving it an appearance similar to a pillow. This is where the “cushion cut” name comes from. A cushion cut diamond is a combination of a more modern and round brilliant cut pattern diamond with a classic, old mine facet pattern diamond cut. This type of diamond typically has a soft square or even rectangular shape, all with curved edges. Here’s an example of a stunning cushion cut from Blue Nile’s Astor Cut line. 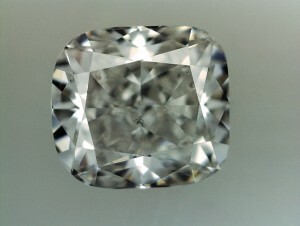 Cushion cut diamonds are often purchased for engagement rings. They’re also commonly used in some fashion pieces. The price of a cushion cut diamond is typically significantly less than the cost of a round brilliant diamond. However, due to increasing popularity of cushion cut diamond rings, these prices may vary and rise significantly. Just like with other diamonds and precious gemstones, it’s important to look at any cushion cut diamond’s certification before you make a purchase. In general, you’ll want to look for diamonds certified by the Gemological Institute of America (GIA). The GIA is the most reliable gemological laboratory in the world, making their certification the most important to look for. By looking at the GIA certification, you don’t need to listen as closely to what the store is saying regarding the quality of the diamond. Instead, the GIA certification offers an external, reputable and unbiased appraisal of the diamond. Factors such as the cut, color, clarity, carat weight and much more are evaluated for each stone and all appear as part of the certificate. A brilliant is a diamond that has been cut in a form with many facets, so it can have exceptional brilliance and maximized light that is returned through the top of the diamond. A brilliant cut diamond will most closely resemble a cone in shape and appearance. Round brilliant cut diamonds are considered the “ideal” diamond cut and are easily the most desirable type of diamond available. Considering a cushion cut diamond? Below, I’ve covered the key factors to look for when buying or comparing cushion cut diamonds, from color to clarity. Cushion cuts are one of the worst shapes when it comes to retaining color (or one of the best, if you’re a manufacturer of fancy color diamonds). Cushions and radiants are the two most common diamond shapes in the fancy color diamond market. For this reason, I recommend my readers stick with H or better when buying a cushion cut unless it will be set in yellow or rose gold (in which case, you can go down to J or K). H diamond color is a good value option. It’s also one of the more popular choices thanks to its balance in price when compared to the natural of the diamond color. You’ll notice a significant price jump between each color grade, with H falling somewhere in the middle. Although H diamonds aren’t completely colorless, they are “near colorless” and only have a very slight yellow tint. Almost no one will notice this difference, especially if the diamond is set in rose or yellow gold. 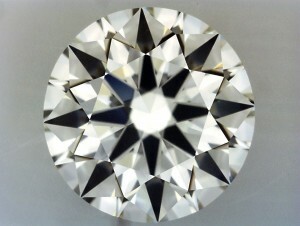 Because cushion cuts have a large open table, it might be difficult to find a nice eye clean SI2 diamond. This means you might have to compromise and end up paying a bit extra for a higher clarity stone. Length/Width Ratio: Whatever you like! As you can see, these parameters are very loose. It’s important to remember that with cushion cut diamonds (as is the case with many other soft-sided fancy shapes), you can’t really evaluate a stone’s cut quality by its numbers alone. The best way we can help you with selecting a cushion cut diamond is by making some educated recommendations. The length and width ratio refer to the proportionate length and width of the diamond and also is a good determinant of how the diamond will look when it is looked at from a face-up view. It is also a good indicator of how big or small the stone will appear to look. Polish is a grade noted on the lab certificate. It refers to how fine of a polished has been applied to the facets of the diamond. This generally has a minimal impact on the price and look of the diamond. Additionally, when you begin to examine the carat of a cushion cut diamond, you will also find that there may be significant differences in the price points due to the emphasis of the carat weight. The carat weight of a diamond is simply the measurement of how much the diamond actually weighs. The price points begin to go up with increased weights because a larger diamond is typically more sought after for a diamond engagement ring, for example, and is more desirable than a smaller diamond and therefore comes at a higher cost. Would you like help finding the right cushion cut diamond? Contact us and let us know what your budget is and we’ll send you some personalized recommendations. We can also help answer any questions you may have regarding the 4C’s: cut, color, clarity, and carat weight. After Rounds and Princess Cuts, the shape I hear about most lately is the Cushion Cut. I think there are two primary reasons for this. Firstly, and most obviously, Cushion cuts are simply more popular now than they have ever been before. They manage to look elegant and understated while still bringing a level of brilliance almost equal to a round diamond like in this pave engagement ring. Almost as important as this is the fact that Cushion cuts are simply a very confusing cut. There are a whole host of terms specific to cushion cuts that need to be understood, such as modified cushions, classic cushions, chunky cushions, broken glass, crushed ice, no culets, large culets, old minders, square cushions, and rectangular cushions. Modern Cushion cuts can be classified into one of two main categories: standard or modified. You can view the differences between the two in the two collections of plot diagrams shown on this page. Above, you can see the collection of standard cushion cut facet plots and to the right, the collection of modified cushion cut facet plots. 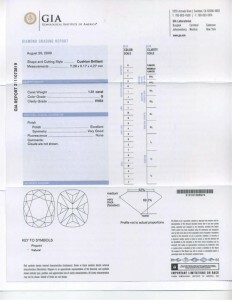 Likewise, I have posted to the right and to the left sample GIA certificates correlating to the two cushion cut styles. For a better understanding, take a look at the videos of this standard cushion cut and this modified cushion cut. As you can see, the differences between Standard and Modified Cushions are rather minute and technical in nature. Their effect on a stone’s appearance is likewise fairly minimal. The only thing that really differentiates between the two is history. The Standard Cushions are the cutting styles that have been around longer while the Modified Cushions are simply modern variations on the original cushion cut facet patterns. The single greatest mistake people make regarding cushion cuts is that it actually makes a significant difference to the stone’s appearance whether it’s a standard cushion or a modified cushion. In fact, if you’ve reached this page after doing research elsewhere, I’m sure you’ve already heard that line several times before. People will tell you that you need to buy a standard cushion if you want a “chunky cushion” (see below) and you need to buy a modified cushion if you want a “crushed ice” cushion (also below). This is completely inaccurate. The truth about cushion cuts is that it rarely makes any kind of noticeable difference in a cushion cut’s appearance whether it’s standard or modified. Just as there are two distinct categories of cut classifications of cushions, so too are there two distinct categories of “looks” that a cushion cut diamond can display. “Chunky” cushions are those that have clearly defined facet patterns when looking down into the table of a face-up oriented stone. These tend to resemble the way in which round diamonds present themselves. These are often called “antique” cushion cuts. This is actually technically not true since the cushion brilliant cut is relatively modern. The Old Miner is the antique antecedent to the modern cushion cut. Although, it’s clear this look is referred to as an “antique” cushion because this is how Old Miner cuts always present themselves. “Crushed-Ice” cushions are those that have no discernible faceting when you look through their table. All you can see is what looks like broken glass or crushed-ice (hence the name) – a disorganized space of sparkling bling. This is typically what a radiant cut looks like. You also find this effect in corners of pear shapes and marquise shape stones. If you’d like to see the difference between these two looks – the easiest way to understand it is by looking at the two diamond shapes that most exemplify each “look”: Radiants for “Crushed Ice” and Rounds for the clean cut look of the “chunky” cushions. Above is a typically crushed ice radiant. Notice in the picture of the round stone to the right how clearly defined and symmetrical each of the facets are and how different that is from the Radiant to the left. Now just to drive the point home, I didn’t choose those two pictures of cushion cuts above at random. Now that you’re more familiar with the basics of the cushion cut, lets deal with the details of the four Cs that you should consider when shopping for a diamond engagement ring. When it comes to the diamond color of a cushion cut, one needs to be very careful. Cushions and radiants retain their color stronger than any other shape. These shapes are on the opposite end of the spectrum from rounds, which are the best at masking their color. This, by the way, is the reason why the fancy color diamond market is loaded with cushions and radiants and why round fancy color diamonds are extremely rare. Because of this, I recommend people looking to buy cushion cuts who plan on setting them in white gold or platinum stick to H color or higher. Regarding Diamond Clarity, a cushion cut can be a bit tricky. Firstly, it’s important to note whether you’re looking to buy a crushed-ice cushion or an “antique” cushion. The reason is simply that the crushed-ice look, in any shape diamond, is generally a very good hider of inclusions. Additionally, if you’re looking to buy a marquise or pear shape diamond, it’s always best if the inclusions are in the corners as they’ll be very heavily masked by the crushed-ice that’s typically found in the corners of these shapes. Of course, you’ll only know what kind of cushion look you’ll be buying if you can see a picture of the diamond in question – so it’s already a given that you’d be able to inspect the diamond’s clarity as well. Therefore, like always, shoot for the lowest clarity you can find that’s still eye clean. As with the other soft-sided fancy shapes, there aren’t any real hard and fast rules when it comes to the stone’s parameters. Nothing on a certificate will tell you whether or not the stone is an “antique” style cushion or a “crushed-ice” style cushion. Nothing on the certificate will tell you how rounded the corners are: some cushions are nearly round, and some are nearly square. Therefore, if you are looking to buy a cushion cut diamond it is imperative that you limit yourself to vendors who offer clear magnified pictures of their inventory. Just a very general guideline, try to stick to cushions with a depth under 70% and a table under 70%. People will tell you that lower is better, but I’ve seen plenty of very beautiful cushion cuts with depths at 70% and tables at 70%. If you start to go above those markers, the diamond can have a very dead look. Take this diamond for example. 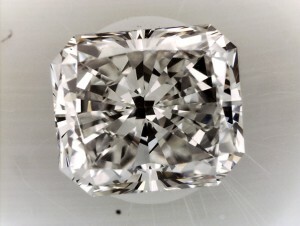 Due to its depth, there is virtually no sparkle to the diamond. People will also tell you to avoid “extremely thick” girdles, but on cushions, this is much less of an issue. Cushion cut girdles are almost always chunky, so there isn’t much you can do about it. Obviously, if you have two seemingly equivalent stones, and one has a medium girdle, and the other has an extremely thick girdle, you should buy the one with the medium girdle. But this rarely happens. You should first look to find a nice looking cushion that is an H color or higher with as low of a clarity grade as possible that’s still eye clean in as large of a diamond as possible that fits your budget. Only after you accomplish that should you focus on girdle thickness. I have a question about cushion cut diamonds. 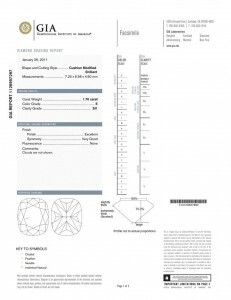 I have noticed that some of the diamonds I have looked at on James Allen have certificates that have the statement “crown angles greater than 40 degrees” under additional comments. What type of effect does this have on the diamond (other than lower price)? I know that crown angle is important in round brilliant cuts but if the diamond is rated as an excellent cut why does the crown angle matter? Which do you think is the better deal? Depending whether you prefer the crushed ice look or the antique chunky look. I didn’t like the G you selected. Let me know how it looks when it arrives. Thanks for your quick response. I was already leaning toward the H that I previously sent but just out of curiosity’s sake what made the G not as likeable? I understand the clarity is high and not cost effective vs an eye-clean diamond of lower clarity and it is smaller than the H but where these the only reasons? Would that change anything since the side stones are F-G and the diamond I am considering is an H? The H color is fine with those settings. As for the G, I didn’t like the faceting of the diamond. 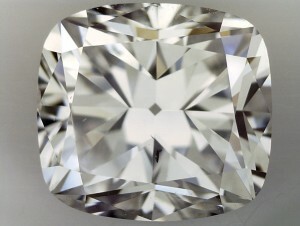 Cushion cuts don’t have the same standards for faceting as round/princess diamonds do. It looks like that one is a cross between a crushed ice and antique look (no doubt done to save weight while cutting). I know the only difference is antique vs crushed ice so I have asked them to compare the stones to see which one looks more brilliant. Thanks again for your help. I will be sure to let them know you helped when I make my purchase. The difference between those is purely stylistic. I wouldn’t have an opinion. I had a James Allen’s gemologist compare the two diamonds and he said that one outperformed the other. It should get here by Friday. I’ll let you know what I think when I get to see it and I’ll send a picture. I got the ring from James Allen last week and couldn’t be happier with it. Thanks for writing and letting us know. I’m delighted that you were pleased with our help. We wish you and your partner a life of happiness and fulfillment.